Make your dear one very happy and delighted on Valentine's Day with this Sweetest Equation of Two Hearts Valentine Combo containing your love for his/her. 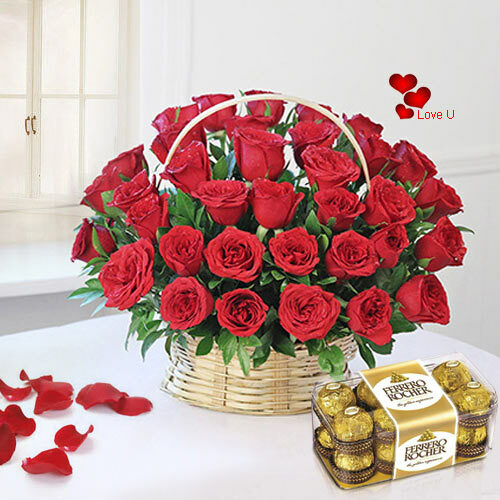 This Gift Combo contains a beautiful bouquet of 40 Red Roses and a Box of 16 Pcs Ferrero Rocher Chocolates. Flowers Delivery Pune, Send sweets Bilaspur, Wedding Cake Ramgarh, Diwali Mithai Cuttak, Send Flowers and Gifts to Madurai, Online Shop Bhopal, Flower to Shillong, New Year Flowers Tanjore , Fresh Fruits Thiruvanthapuram, Send Gift Barrackpore, Dry Fruits to Gadag, Birthday Delivery Hapur, Sending to Mumbai, Flower shop Karimnagar, Bhuj Online Cake Delivery.